Tick season is here. Protect yourself from Lyme disease exposure! In the mid 90's when I was studying Biological Medicine, my instructors were sounding the alarm that Lyme disease was becoming an epidemic. At the time, this was only recognized and accepted by the most expert in the holistic health fields and was totally poo-pooed by the medical community. Doctors might test people for Lyme disease, but since there is no truly accurate test, the medical community took these negative test results as proof that Lyme was a hoax. Alas, that is not true. Lyme disease has continued to grow and is even beginning to be recognized by the forward thinkers in the medical community as a true epidemic. Now we practitioners in the holistic community are recognizing that Lyme can be dormant in the body for decades and bloom out when enough other insults to one's health compromise the immune system. And the most vulnerable to acquiring or activating dormant Lyme in the body are those with fibromyalgia or mold disease. Does this mean we must stay indoors and be fearful of ticks? Absolutely not! With the proper protection, you and your loved ones can enjoy all that springtime has to offer. It's healthy to get outdoors, hike, camp, garden, or play sports. I'll help you to prevent a tick bite with this information I'm sharing. So, read on and enjoy your spring! Ticks like low areas with debris and cover, like weeds, fallen leaves and pine straw. When you're in the woods, try to avoid the overgrown areas. If you stop to sit and admire the view, spread a towel or jacket to sit on, then check it carefully when you get up. 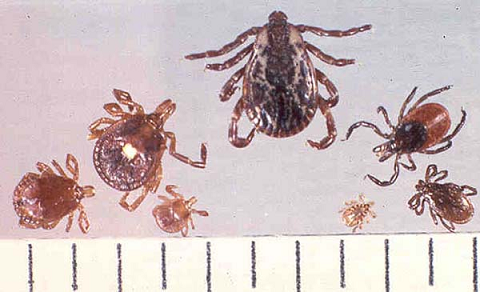 Ticks can be spread into your yard or the woods by deer, rabbits, squirrels, raccoons, and rodents. Always do a tick check each evening after you've spent time outdoors. Dressing in light colored clothing makes the ticks easier to spot. Wear light colored long pants and tuck them into your socks, so a tick can't crawl up your leg. This is usually how they travel onto your body... you pick them up on the ground and they walk upward looking for a place to attach. On the body, be sure to check the head thoroughly, along with behind the ears, under the arms and anywhere that clothing is tighter (around the tops of the legs and waistband, for example). Be aware that nymphs (baby ticks) are about the size of a poppy seed and can also bite and transfer disease, so watch for small dark spots, too. When I was a kid, we always used a hot match-head to burn off ticks. Wrong!! The best way to remove a tick is to grasp it gently with tweezers as close to the skin as you possibly can and gently pull out, being careful not to leave the head behind. Save the tick in a plastic bag, in case further identification is needed. Lavender, Rose Geranium (sometimes just called Geranium), Eucalyptus and Lemon. Put a total of 30-40 drops of essential oil to every 3 oz of water (use a single oil or a combination of the above) in a spray bottle. Shake and spritz on each person, covering shoes, clothes, exposed skin and hair with a light mist. Cover the eyes while spritzing the hair and do not spritz the face. Reapply every 2-3 hours that you are outdoors. An essential oil called Pennyroyal is very effective, but is toxic if ingested, so I don't recommend it. Also all essential oils are harmful for cats! Their systems cannot process the oils, so please do not use these on your cat. You can definitely spritz this on your dog, just be sure to cover the eyes while you spray. Again, there's no need to be fearful. Just take the proper precautions and enjoy your springtime!